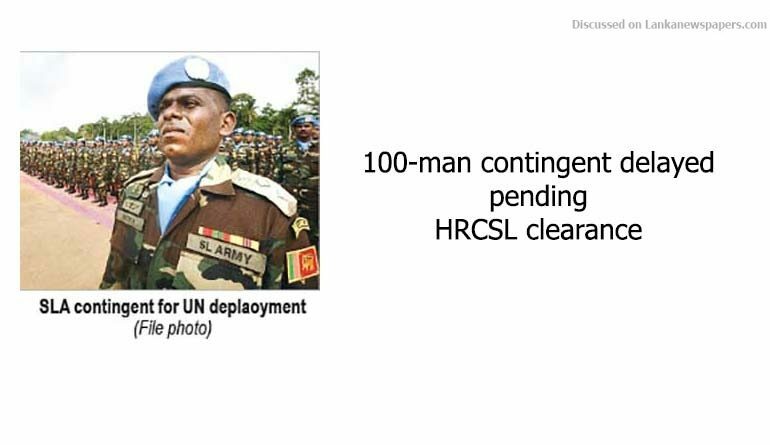 The deployment of 101 member Sri Lankan Army contingent in Lebanon under UN command has been delayed pending clearance by Human Rights Commission of Sri Lanka (HRCSL). The delayed contingent is part of 150 strong Twelfth Force Protection Company (FPC) for the United Nations Interim Force in Lebanon (UNIFIL). Authoritative military sources told The Island that the Army headquarters had received instructions from the UN that officers and men assigned for overseas deployment under UN command should be cleared by the HRCSL. Sources said that the instructions had been received soon after 49 members of the contingent left for Lebanon. Six officers and 43 men left for Lebanon on Feb. 18 and 19. Asked whether UN directive had been issued in respect of the Lebanon deployment, sources said that from now on all overseas military missions would be subjected to HRCSL approval. The HRCSL comprises Dr. Deepika Udagama (Chairperson), Hamid Ghazali Hussain, Saliya Pieris, PC, Ms. Ambika Satkunanathan and Dr. Upananda Vidanapthirana. Saliya Pieris will relinquish his office on March 31 in the wake of him being named the Chairman of the Office on Missing Persons (OMP). The Lebanon deployment was to be completed by March 6. Sources acknowledged that initially the UN had sought clarification on the conduct of Lt. Colonel Rathnappuli Wasantha Kumara Hewage, contingent commander. The contingent comprised primarily Sinha Regiment and other affiliated units. But subsequently, the SLA had been told the entire contingent required clearance. The Sinha Regiment led contingent will replace Gemunu Watch troops currently serving UNIFIL. Sources pointed out that UN Department of Peacekeeping Operations had called for inquiry into Hewage’s conduct on the basis of unsubstantiated allegations made by the Tamil Diaspora. They had questioned Hewage’s conduct during ground operations in Kilinochchi and Puthukudirippu in 2009, on the Vanni east front where the LTTE was brought to its knees in May of that year. Holding up of a large contingent of Lebanon bound SLA was the most serious obstruction since the UN and Western powers began acting on UN recommendations in respect of the Sri Lankan military on the basis of unsubstantiated and unproven war crimes allegations propagated by interested parties, a senior military officer said. The officer pointed out that the Tamil Diaspora had moved against the Lebanon contingent in the run up to 37 Sessions of the Geneva-based United Nations Human Rights Council (UNHRC). Officers as senior as Chagi Gallage, Director General, Infantry, holding the rank of Maj. Gen earlier had been denied Australian visa also on the basis of accusations directed at the fighting formation he commanded on the Vanni east front in 2009. Australia has found fault with the conduct of 59 Division deployed east of Jaffna-Kandy A9 road. War winning Army Commander Field Marshal Sarath Fonseka, Gen. Jagath Jayasuriya, Lt. Gen. Jagath Dias, Maj. Gen. Shavendra Silva and several other senior officers had been subjected to various punitive measures. Some had been faulted for commanding fighting formations. Military sources said the pro-LTTE Tamil Diaspora could interfere in all future overseas military deployments by simply flooding UN Department of Peacekeeping Operations with petitions. Sri Lanka contributes to several UN military missions since 2004. Former Navy Chief of Staff and Eastern Province Governor Mohan Wijewickrema told The Island that for want of counter measures, the Tamil Diaspora was pursing their campaign. Wijewickrema pointed out how a section of the international community, NGOs and the Diaspora worked in unison for a common goal whereas the government did absolutely nothing to correct the situation. Retired Rear Adm.Wijewickrema pointed out that on the basis of unproven allegations the deployment of a military contingent had been delayed pending an inquiry whereas Lord Naseby disclosures which should have prompted a fresh appraisal of Geneva Resolution 30/1 were conveniently ignored. The navy veteran asserted that Western powers and Diaspora would mount pressure on Sri Lanka by way of taking measures against the military.